An organisation that plans an agitation in Darjeeling will hold a scaled-down demonstration tomorrow keeping in mind the inconvenience the animals at the Padmaja Naidu Himalayan Zoological Park might face. Members of the Sherpa community will demonstrate outside the premises of the Himalayan Mountaineering Institute at 10am tomorrow to protest the establishment's decision to shift the statue of Tenzing Norgay Sherpa from the current location on the campus. The Sherpas had said on Friday that they should have been informed about the plan to shift the statue's location and the decision had "hurt" their "sentiments". One has to pass through the premises of the zoo to enter the mountaineering institute and both the facilities share the same entrance. The organisers of tomorrow's agitation today told The Telegraph that their protest would be scaled down so that animals in the zoo were not disturbed. The HMI authorities said they were shifting the statute to a spot 20ft away within the compound as cracks have developed in the surrounding areas. "We will gather in front of the zoo at 10am tomorrow. We will put up placards and demonstrate but will not enter the zoo as it may inconvenience the animals there and also the tourists who are inside. A few of us will then proceed to the HMI to submit a memorandum to voice our grievances," said P.T. Sherpa, the vice-president of the United Sherpa Association, which will hold the demonstration along with the Sherpa Buddhist Association and Darjeeling District Tribal Association. The Darjeeling zoo is home to red pandas, snow leopards, Himalayan bear and a host of other animals and birds. A few animals might hear the demonstrators, as the nearest animal, the black Himalayan bear, and an enclosure for birds, are about 50 feet from the entrance. P.T. Sherpa said the community wanted a halt to the statue's shift. "We are not aware of what the HMI plans to do and why they are shifting the statue. Tenzing Norgay is our community's biggest hero and an international icon and we cannot just allow people to move the statue as if it were a showpiece in a showroom. Earlier, we were demanding that the work to shift the statue be stopped till we hold a meeting with the HMI authorities but now we feel the statue should not be shifted at all," said P.T. Sherpa. Told about the agitation, Col. Gulshan Chadha, principal, HMI, said: "It is very sensible on their part that they are demonstrating outside the zoo gate keeping in mind the comfort of the animals. In any case, they have a right to protest in a democratic country and I do not have any problem with their demonstration." The HMI principal said he was in Arunachal Pradesh and would meet the members of the Sherpa community once he returned to Darjeeling on February 22. He is also the director of the National Institute of Mountaineering and Allied Sports, which is situated at Dirang in Arunachal Pradesh. Chadha had said on Friday that the statue was being shifted for a number of reasons. "Near the place where the statue stands lies an underground water reservoir. Although it is not in use, we have found that cracks have developed in the surrounding areas. The HMI museum which was built at a cost of Rs 5 crore and has artefacts worth more than Rs 5,000 crore has tilted 12 degrees to the left. If we do not do anything, the entire HMI premises' safety will be at stake," he had said. The HMI principal had also said that work to shift the statue couldn't be stopped as they wanted to finish the work before Tenzing's 101st birth anniversary on May 29 and before the rains lash the hills. 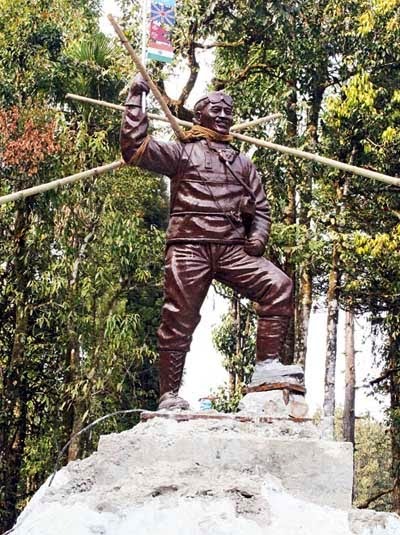 Sherpa community to protest against Tenzing Norgay Sherpa statue shift - An organisation that plans an agitation in Darjeeling will hold a scaled-down demonstration tomorrow keeping in mind the inconvenience the animals at the Padmaja Naidu Himalayan Zoological Park might face.